Even today, when the notion of spending long periods of time in a foreign country is more common than ever before, there are not many Westerners who decide to pick up and move to Japan. This, however, was the case with Pico Iyer, a British-born American essayist and novelist best known for his travel writing. His 1991 memoir, The Lady and Monk, recounted the story of his romance with the Japanese woman, whom he met while in Kyoto, who later became his wife. In Autumn Light, he offers a sequel of sorts, with a new memoir that opens 30 years after The Lady and the Monk left off. Iyer and Hiroko, who appeared as “Sachiko” in the earlier memoir, are living in Nara, a historic city 20 miles south of Kyoto. When Iyer isn’t writing his journalistic pieces and essays, he can be found visiting his mother-in law, walking to the nearby post office, or playing ping pong with the pensioners at his local health club. It’s a tricky juxtaposition, but Iyer revels in the dissonance between the various parts of his life. Yet these quotidian activities serve as a backdrop to reflections of a more profound nature. 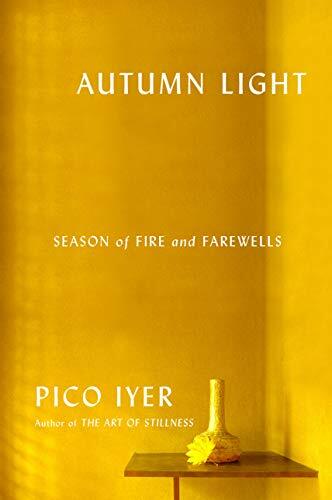 In the wake of the death of his father-in-law, Iyer sees everything around him through a meditative lens, and as autumn erupts in brilliant fall foliage and cold rains, he contemplates the transitory nature of life. Interwoven between the ping-pong and the autumn leaves are darker, more troubling strands. Hiroko’s brother, a Swiss-trained analyst, is painfully estranged from the family, refusing their every effort at reconciliation, even in the wake of his father’s death. Iyer’s writing is both simple and lyrical, an apt style for a British/American with Indian roots living in Japan. The memoir succeeds, with its deceptively quiet descriptions of autumn both in the natural world, and in the season of his and Hiroko’s own lives, in echoing a uniquely Japanese appreciation of the fleeting nature of time, as well as the humbling acceptance that nothing lasts.